"A simple, sweet stuffing that may be used as a side dish, or to fill the bird." A basic simple recipe. Not too much extra flavor aside from the bread, apples and pecans. 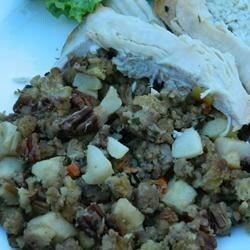 This is my kind of stuffing, easy and good. This was a real,'pass the dish please" My in-laws were asking for the recipe! Needless to say,I think we'll be using it as our stuffing instead of a side dish. I tried this recipe with chicken last night and must say that it is very tasty indeed. The nutty flavour of pecans softened by apples is truly unique. Try this recipe for yourself.